You have come to the right place if you are looking to get started with making your own natural beauty products and stock up your home apothecary. This resource guide is a companion page for my books on plant-based skincare, Make & Give Home Apothecary and The Natural Beauty Recipe Book. If you don’t yet have a copy of either of these books, head over to my shop to purchase them. These two books both contain recipes that use ingredients from my own natural beauty apothecary, where I keep dried botanicals from the garden, various natural colorants, skin-nourishing oils, waxes, and butters, pure essential oils, and more. 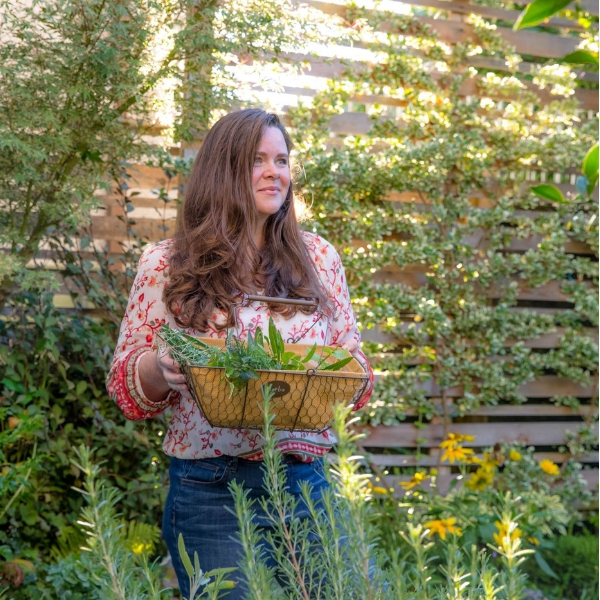 My personal apothecary is a wonderful source of wellness and creativity (just looking at all of my supplies gives me inspiration for new recipes), and I want to encourage you to make your own. 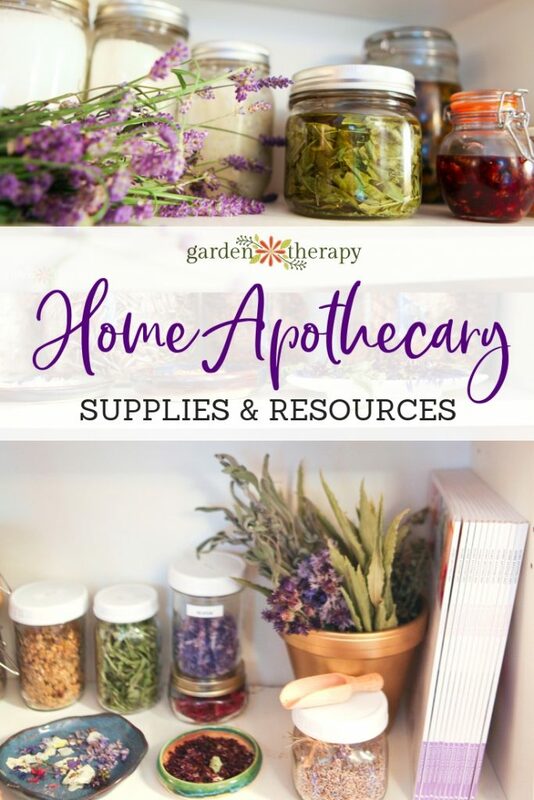 This resource guide will give you a ton of ideas for what to stock your own home apothecary with and how to find the various ingredients that are useful to have on hand, as well as equipment like double boilers and supplies for packaging. My own apothecary has taken shape in what used to be my garage. 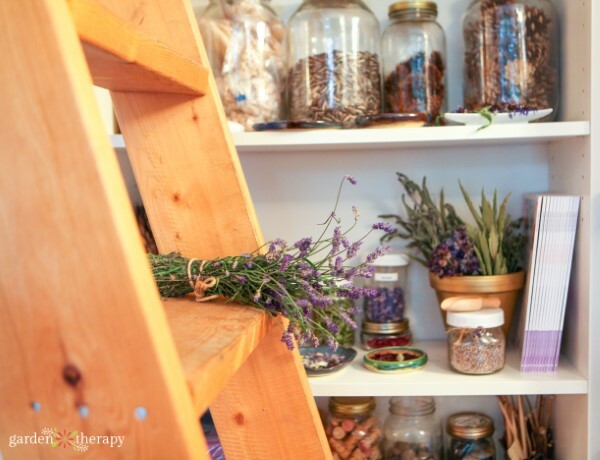 Now it is a place where all of my natural beauty and herbal supplies are kept, so when I want to make a project I simply head out to the studio and begin creating! As you can see, it’s my happy place. The garden studio is the perfect place for drying flowers and herbs because it is cooler than the house but dry and protected. Right now I have hops and a ton of flowers hanging to dry. 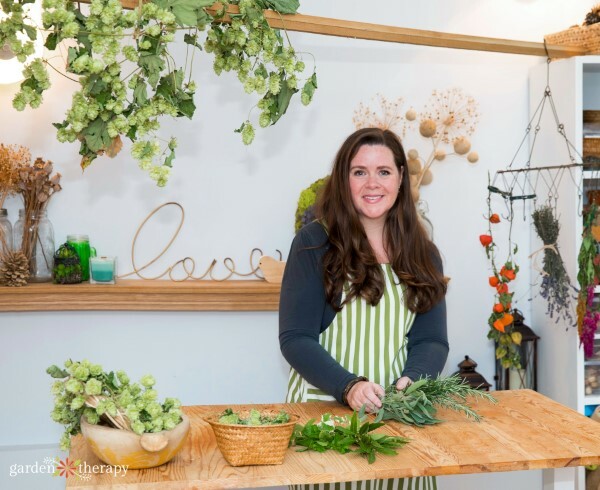 My apothecary garden shed is my happy place, and whether you have a whole studio or just a shelf to devote to it, I hope you will be inspired to begin your own home apothecary too. 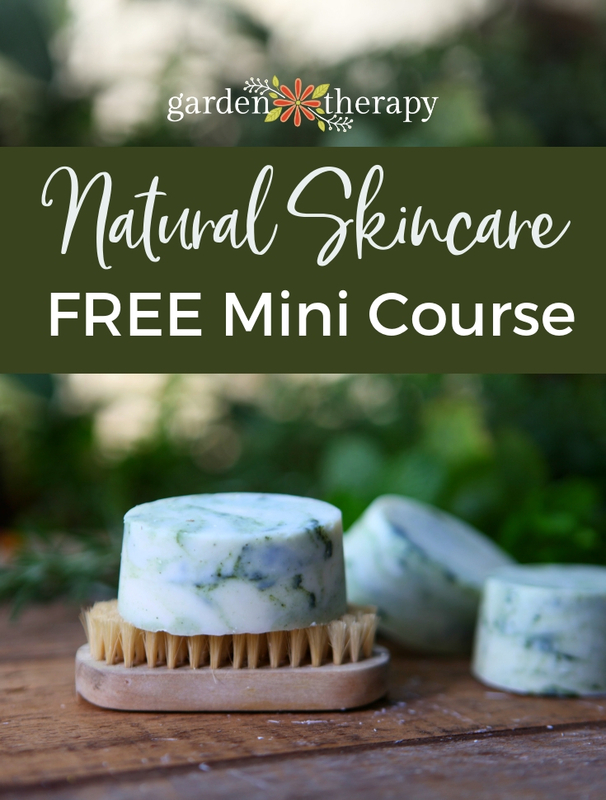 Here you will find everything from the ingredients to the tools you will need to get started making your own DIY plant-based beauty products from the books. See all of the books that have been created in my studio here. In many cases, you will have everything you need in your kitchen, in other cases, you may need to purchase some of the supplies. This resources and supplies page is updated regularly to ensure that the items you need to make these projects can be accessed easily. If you are here to get a handle on your shopping list so you can start making your own DIY plant-based beauty products and stock your apothecary, then let’s get to it! The supplies are listed by category so you can easily find recipe ingredients and materials from the two books. If the text is green, then it is a link you can click to take you straight to where you can buy the item mentioned. Some of the links go to affiliates which means that I get a small commission on each sale. Many of the labels, tags, gift boxes, and bags that I use are from Evermine Occasions where I collaborate as a blogger. I have written 120 projects for Evermine with different customized labels each time. See all of my Evermine projects here. I have also created a number of free canning label designs in both regular and wide-mouth sizes. For these, all you need is label paper and a printer. Tubes, tins, and pots for natural beauty projects are usually only available at specialty soap-making shops. You can certainly reuse the containers from store-bough cosmetics, just wash them well and boil to sterilize. You may also need some Goo Gone to remove the labels. If you are making large batches or want sparkling new containers, here are some that I use regularly. There is much variety in quality for essential oils and in price as there is no separate regulation for essential oils. The best way to get started with essential oils is to purchase a starter pack and start using them. Remember, essential oils are powerful and should only be used with the approval of a healthcare practitioner. Many of the recipes in this book only contain a few drops of an essential oil, which may make you question whether or not it is necessary. But with these small-batch recipes and the potency of essential oils, it really does make a world of difference to have even 1-2 drops. 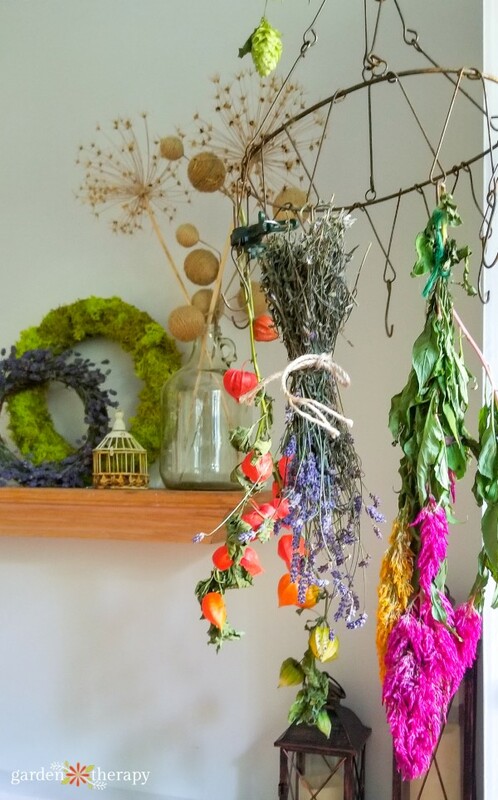 Ground up dried herbs and other organics work well as natural colors in your handmade beauty products. While you may not get the same bright hues as with synthetic colors, you will get natural tints and the peace of mind that what is going on your skin is good for you. 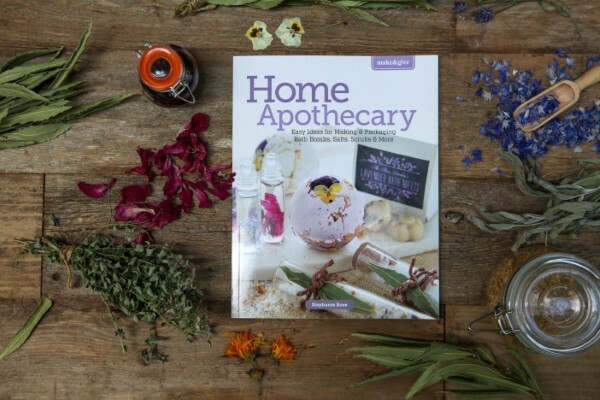 Still need a copy of Home Apothecary and The Natural Beauty Recipe Book? Get your copies here today! Great list! Using duct tape for lip balm labels is a great idea. Do you find that the edge where the tape meets gets sticky over time? Not at all. But I guess if it did I could replace it. Although I tend to go through my lip balm very fast! Every time I try to order the digital book, the PayPal link does not work… love your blog! H Paula, how frustrating! I’m sorry that is happening. You can also get the book on Etsy (PDF version) and Amazon (Kindle version). I’m sure one of those will work for you. If not, please let me know! Recently I purchased your book Home Apothecary. I am in love! I am looking to make the massage and lotion bars but cannot use beeswax, as I am allergic. Would soywax be a good alternative? And if so, would it match per gram? Or, is there another wax that I could use? Hi Darlene, that’s wonderful! And yes, soy wax is a good alternative. It’s a bit drier feeling thank beeswax, which is slicker, but you can try it as a substitute in the recipes 1 to 1. There is also candelilla and carnauba wax which is plant based. It is hard and shiny so you would use less for firmness. Look for good quality cosmetic grade waxes with eco certification where possible. Thank you so much! I do happen to have some candelilla wax on hand as well, so I shall try that in a second batch. I too agree that all waxes should be ECO certified. Wish me luck!